"Hey Guys, I Found Heaven"
"Take the extra walk down to Makalawena, but don't tell anyone else about it. The seclusion is the BEST part. Signs will guide you, sort of... keep an eye out. Over a few lava fields and BAM - there's the pearly gates." "You Will Never Want to Leave"
About as perfect as white sand beaches get. The hike in is straightforward and enough effort to keep many away - it felt like I had paradise to myself! This earth has very few beautiful spots that are human free. This beach is close to perfect for "getting away" while close to the airport and town....bring your solitude and forget everything. Our compact rental made it three times at about 25 minutes per run. You know what I'm talking about! I hope this area remains as is....no more development! It is far enough off the beaten path that few people show up. There were maybe 5 people on it when we got there on a Tuesday right after lunch. There is a short drive through the lava field, but 4wd or higher clearance vehicles won't have any problem. Water is good for swimming, but poor snorkeling or boogie boarding. 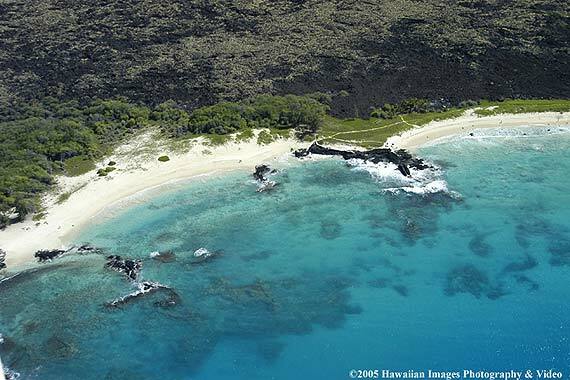 This beach has a reputation on the Big Island for its pristine white sand and clear blue green water. At one time it was one among a list of beaches that could only be accessed by a 4 wheel drive vehicle or by walking down the rough lava rock road to its shore. Now there is a nice paved road, and bathrooms and showers are available.